There's been quite the debate over who will win Super Bowl LII. Will Tom Brady and Bill Belichik lead the Patriots to yet another win? Or will the Philadelphia Eagles win their first championship since 1960? One thing that won't be up for debate is the MVP of your Super Bowl Watch Party. Spoiler alert, it's wine! We've collected some of our favorite recipes for snacks perfect for the big game from Bon Appétit, Food & Wine, and Southern Living and paired them with some of our favorite wines. CHIPS & GUACAMOLE: Every good party needs chips and dip and this one will guac your world. A bright white like Marqués de Cáceres Verdejo, a dry Riesling like August Kesseler Rudesheim Riesling, or a zesty New Zealand Sauvignon Blanc like Mohua all pair perfectly. 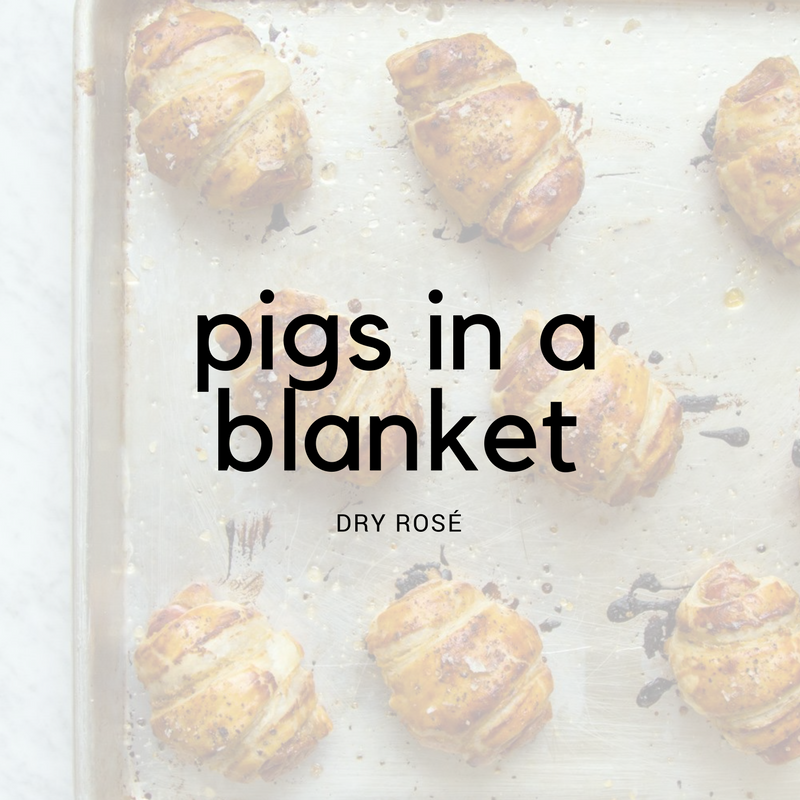 PIGS IN A BLANKET: Few things disappear as quickly at a party as Pigs in a Blanket. The warm sausage and crisp pastry...we're getting hungry just thinking about it. These from Food & Wine are brushed with a tasty mix of honey, mustard, and fresh black pepper to kick things up a notch. Pair with a dry rosé, like La Vieille Ferme or Miraval (both made by the Perrin Family). PIZZA: Whether or not your team ends up breaking a pizza your heart, you'll want a slice of this pie from Bon Appétit Magazine. Get creative and add your own toppings or stick to classic cheese. Either way, pair with a Barbera or Dolcetto like Massolino produces. CHILI: How could we share recipes for the Super Bowl without including a recipe that is served in a bowl? Chili is the perfect antidote to cold weather and bonus- this one is made in a crockpot so you'll spend less time cooking and more time drinking! Try this crockpot chili with South African Ashbourne Pinotage, a Rhône Blend from Famille Perrin like Châteauneuf du Pape Les Sinards, or an Argentinian Malbec (you really can't go wrong with anything from TintoNegro). NACHOS: These are nacho average chips and toppings. 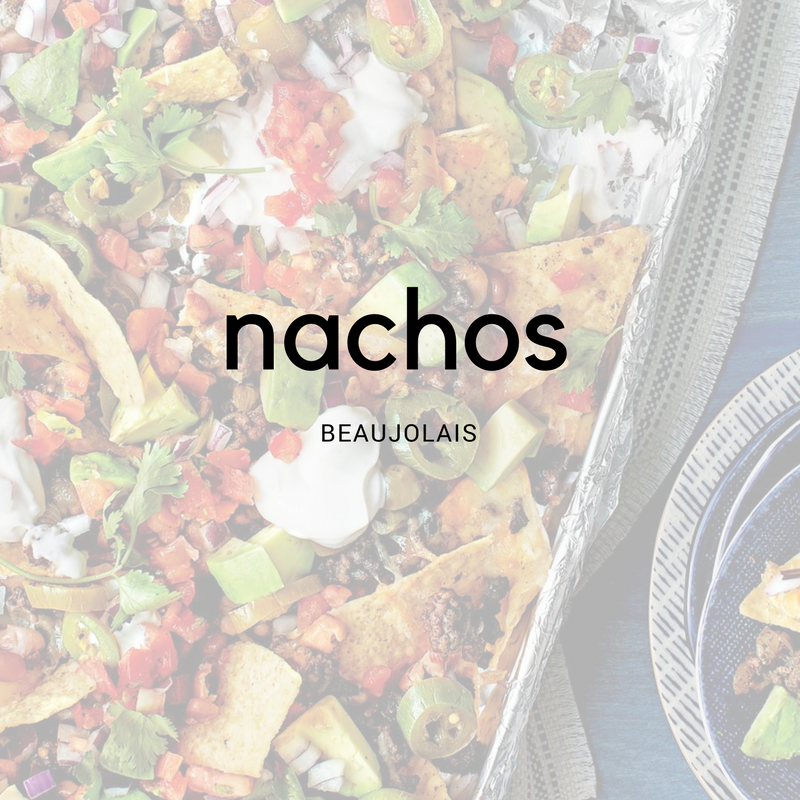 These sheet pan nachos are customizable for any taste, fast, and fun. So if the party eats them up (and they will! ), you'll be able to pop another round in the oven. This Southern Living recipe is elevated when paired with Thibault Liger Belair Moulin à Vent Vieilles Vignes Beaujolais. Serving anything fried- French fries, fried chicken, fried pickles, etc? Serve champagne. We love Champagne Delamotte Brut or Blanc de Blancs. Serving wings? With spicy dipping sauces or marinades you'll want to go with something semi-dry but a little sweet- like Pichot Vouvray. Finally, the meatier the dish (maybe you add bacon and sausage and pepperoni to your pizza...), the heartier the wine. Borgo Scopeto makes a beautiful Chianti that can stand up to hearty meats. Read on for food and wine pairings perfect for the Holiday season. We'll cover the eating and drinking, it's just up to you to be merry! Unlike more traditional Thanksgiving, really anything can go menu-wise at Christmas. We selected a few of our favorite wines (that we love to both give and receive, so if you're still looking for that perfect gift and our Gift Guide didn't quite do the trick....) and paired them with some delicious dishes. If you're having friends over for a holiday gathering, if you're just spending time at home with your feet up to relax, or if you need a snack to tide you over between big meals, you can't go wrong with wine and cheese. Try Domaine Delaporte Sancerre Silex with some Crottin de Chavignol. And once you've had your fill of ham and turkey and gingerbread and peppermint, the Sancerre Silex is a perfect wine for Thai or Chinese takeout. Of course at Christmas time you'll be eating hearty meats. With more traditional holiday fare like tenderloin, prime rib, and rack of lamb pour a glass of Massolino Barolo Vigna Rionda. The flavors are intense, complex, refined, and unique and the color is a beautiful garnet that is sure to provoke oohs and ahhhs from all who drink it. This is the holy grail of Barolo top vineyards. For special times with close family and friends, you need a special wine and this is it. If you're celebrating Hannukah and are looking for something to sip with your latkes, try Champagne Delamotte. The bubbles cleanse your palate and the acid cuts through the oil. Not to mention Hannukah is truly a celebration- a festival (of lights)- so you need a wine that brings the festivity. If you're tired of making decisions (what gifts to buy, what time to arrive at Grandma's house, what to wear to the party...), we have a wine that will be the easiest (and one of the best!) decisions you'll make all holiday season. One wine that can start almost any meal off well is Gradis'ciutta Friulano. It's a beautiful white perfect for beginning any dining experience. Finally, while not a food and wine pairing, mulled wine is sure to make you merry! Two of our favorites to use are Stark Condé 3 Pines and Padrillos Malbec. Bon Appétit Magazine and Ina Garten both have delicious recipes. Pick one, whip up a batch, and warm up on a cold night! In part one of our Thanksgiving wine and food blog, we suggested a variety of wines for all tastes and all budgets from around the world. If you're a little overwhelmed by all the options or if you're still trying to decide a final few things to cook, take some inspiration from our Marketing Director Perry Riddle's Thanksgiving menu. On my table for Thanksgiving, I usually serve mostly dishes from my favorite cookbook author, Ina Garten. This year I will be making her Roast Turkey with Truffle Butter, Spinach Gratin, Garlic Roasted Potatoes, Cranberry Conserve, and String Beans with Shallots. I also will be serving a Honeybaked Ham, my mom’s Chicken and Dressing, yeast rolls, and my grandmother’s Sweet Potato Pie. Hors d’oeuvres: To start I like to make some simple nibbles like Ina’s Truffled Popcorn, mixed nuts, and Cheese Straws and serve Delamotte Brut. There’s just something about Champagne at a special holiday that screams “festive”. Dinner: I usually serve a red and white for dinner. For white, my go-to is always an off-dry Riesling. With my dinner menu, there is the typical element of sweetness that you find on the Thanksgiving table, but I don’t overdo it. Wines such as August Kesseler’s Riesling R have an innate sweetness that beautifully pairs with foods while maintaining a crackling acidity that keeps things refreshing. Plus I’ve found that this wine is a fan favorite among all my friends. And, honestly, the combination of Honeybaked Ham and this wine is stunning! For reds, my choice this year will probably be Southern Right Pinotage (which in my opinion is the best Pinotage for the money in the world). The abundant blue fruit, fresh acidity, medium body, and spice notes really blend well with the food. Another suggestion would be MAAL biutiful Malbec: once again, a wine with abundant fruit, spice notes, and an easy-going structure Overall, the key with reds is to avoid aggressive tannins and to embrace juiciness and fruitiness. Dessert: Thanksgiving is the perfect time to enjoy a decadent dessert wine. My grandmother’s Sweet Potato Pie is overall not a sweet pie but a very spicy one. Fresh grated ginger and lots of allspice and cinnamon really wake up the taste buds. I’ve found that Gewurztraminer can really be a gorgeous pairing with sweet potatoes when there’s an exotic spice element in the dish. The absolute ideal wine here would be Domaine Weinbach Gewurztraminer Grand Cru Mambourg Vendanges Tardives, but if you’re like most of us and can’t get ahold of this rare gem, the Cuvée Laurence or Cuvée Theo bottlings also have a light sweetness that can pair nicely with desserts that aren’t overly sweet. Everyone has their own family recipes and own traditions, but if you're looking to spice yours up this year or make some new traditions of your own, we hope these blogs have helped! We'll leave you with a recipe for homemade cranberry relish from our Patrick Harney. The only thing missing from the recipe is the addition of 3 shots of Grand Marnier or Cognac (more depending on the number of annoying family members you plan on seeing). Happy Thanksgiving! A little turkey, a little wine, and everything's fine. But how do you decide what wine to drink with the turkey...and the yeast rolls, the sweet potato casserole, the stuffing...? With so many different flavors all competing for attention at Thanksgiving dinner it can be a true challenge to pick the right wine. But Vineyard Brands is here to save the day! "After many years of casual trials and two consecutive years of full on Thanksgiving experimentation, I am absolutely convinced that Rosé Champagne is hands down the most appropriate wine for the Thanksgiving Table. Unlike most whites it has the bright red fruit to stand up to the heavier dishes and the red berry flavor of the cranberry sauce (this is usually the limiting agent for most wines on Thanksgiving and is a required Thanksgiving condiment). It’s bright and refreshing after each bite whether its dry turkey, rich bready/herbaceous stuffing, tart cranberry, or creamy gravy. It washes away the bitterness of Brussel sprouts and can balance the sweetness of roasted carrots and sweet potatoes. Cornbread: perfect. Crescent rolls: even more perfect. Mashed potatoes with roasted garlic?? : easy one. It is the ultimate Thanksgiving wine!" Looking to take Patrick's advice and add a sparkling wine to your Thanksgiving table? Champagne Delamotte makes a beautiful Brut Rosé. And although not technically Champagne, Alma Negra in Mendoza, Argentina has a Brut Nature Rosé made from Malbec and Pinot Noir grapes. Patrick Harney, Vineyard Brands Sales Manager for DC, Delaware, and Maryland, has some wonderful recommendations of his own...and don't think he suggests Vineyard Brands because he works here. Long before he began working for the company, wines from the Vineyard Brands portfolio were on his family's Thanksgiving table for years. Wines from the VB portfolio across the board share comfortable, food friendly, savory characteristic along with a level of class regardless of their region or continent of origin. These family wines are perfect for your family meal. Now settle in, Patrick H. has just the wine for every taste. 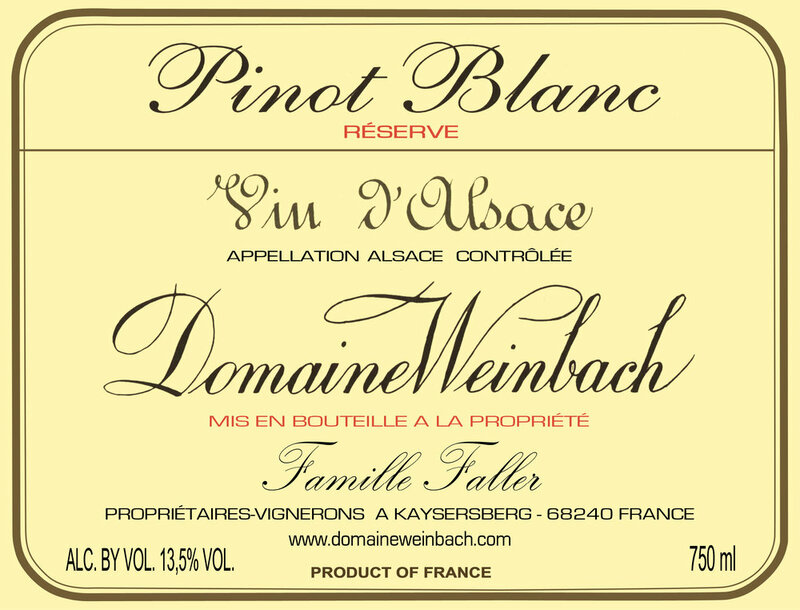 Weinbach Pinot Blanc or Sylvaner-super versatile and crowd-pleasing, both have hints of hard spice in addition to their wonderfully complex fruit traits making them perfect autumnal whites. When the conversation at the table turns political all you need to do is stick your nose in the glass and the aromas will take your mind away. By the way the ‘16’s just arrived in my market and the wines are off the charts-rich ripe fruit with precise acidity. Thibault Liger Belair Moulin A Vent-I agree that Beaujolais is one of the best reds to pair with Thanksgiving dinner and Thibault’s are the planet’s best examples of Beaujolais. Pichot Vouvray-very versatile and crowd pleasing…Comfort wine. Tablas Creek Cote de Tablas Blanc-The Viognier in this highlights the savory of the turkey and the sweet of the yams and squash. Massolino Dolcetto-a riff on the Beaujolais theory and there happen to be a lot of Italians in my family, so pasta and other Italian dishes or sides often find their way onto our Thanksgiving tables. And with any meal, Champagne Delamotte Blanc de Blancs is always a welcome addition." Red, white, or bubbly, there's certain to be a wine that will fit your tastes and your needs this Thanksgiving. Port is a fortified wine, produced in the mountainous eastern reaches of the Douro Valley of Portugal. Arguably the most famous fortified wine with a rich history, Port is experiencing something of a resurgence. Curious about port? Maybe a little hesitant to try it? Try a port cocktail! We’ve rounded up a few recipes that are perfect for port first timers and those well-versed in the wine. With all of these recipes, we highly recommend Warre's Ports. Founded in 1670, Warre & Co. is the oldest and one of the most highly esteemed port shipping firms in the world. The Clover Club in New York City makes a delicious cocktail combining the bright, acidic notes of cranberry and lemon with the rich, warm flavors of port and cinnamon. Perfect for the upcoming season, this cocktail has all the holiday flavors you know and love with a unique twist. Port can also be used in some of your favorite, best-known cocktails, like a Manhattan. Use tawny port instead of sweet vermouth and orange bitters rather than Angostura and you have a fantastic seasonal cocktail- no pumpkin spice in sight. Gin and tonics are a perennial favorite, but if you're looking for a new classic, try a white port and tonic. Popular in Portugal, white port adds a different flavor that pairs nicely with either a lemon or lime twist. 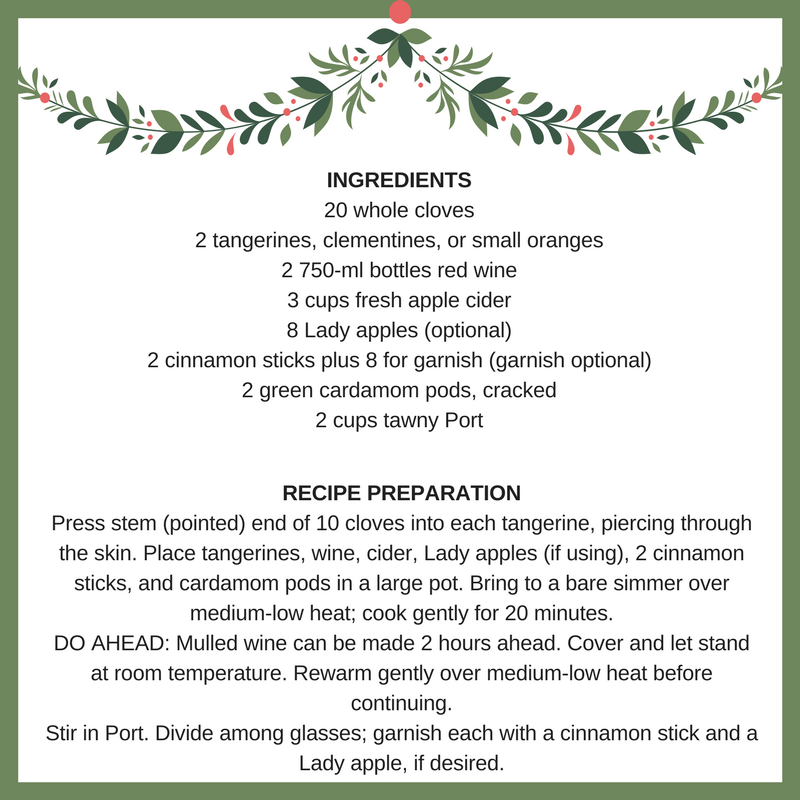 Created for one of the Obamas' White House holiday parties, this aromatic cocktail also uses white port. 1. Combine ingredients and shake with ice. 3. Garnish with thinly sliced orange and lemon wheels. Do you have any favorite port cocktails? Have you tried any of the above? Let us know! Warmer weather and longer days call for picnics, late nights on the porch, and time spent with friends. 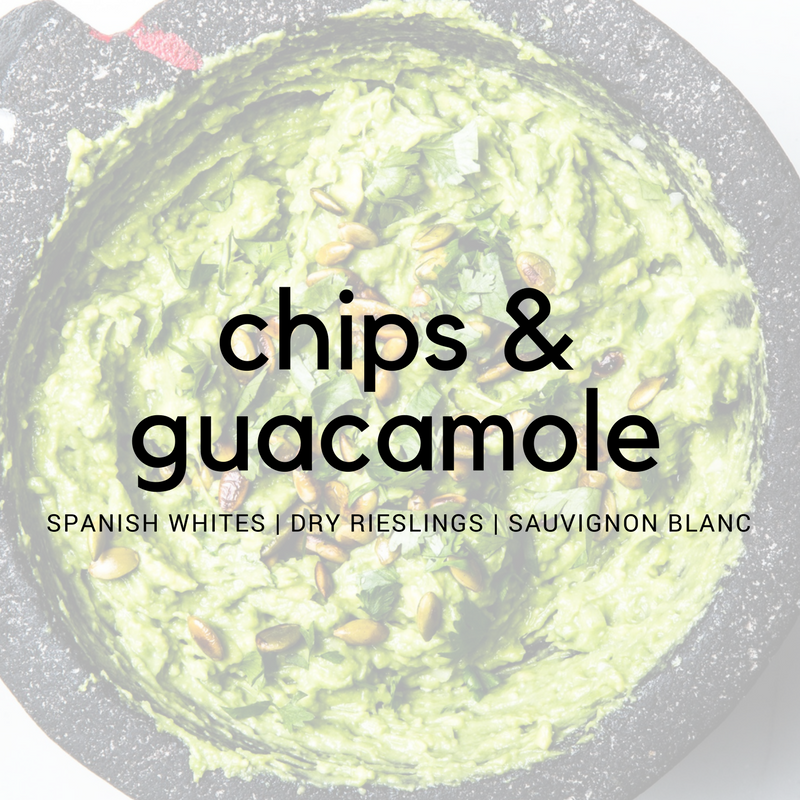 International Sauvignon Blanc Day was last week and we were inspired to pair some snacks and sauv blancs perfect for slow afternoons and breezy nights. Wine and cheese go together like peanut butter and jelly. For our first snack and sauv blanc pairing, Sauvignon Blancs pair brilliantly withsofter cheeses—goat’s milk, yogurt, crème fraiche. Beloved Green's Radish and Crème Fraîche crostini are a simple, light snack that look lovely on a plate. Sauvignon Blancs are often described as “herbaceous” or “vegetal” so it makes sense that they would pair nicely with vegetarian dishes. Try pairing the Sauv Blanc with dishes that allow a little more of the wine’s acidity to shine through. This green goddess hummus from Cookie and Kate is a flavorful twist on the classic snack. In addition to vegetable dishes, Sauvignon Blanc is a nice match for white meats and seafood like prawns, tilapia, and more. This grilled shrimp with melon and pineapple salsa from Eating Well smells and tastes like summer. Like we mentioned, Sauvignon Blanc pairs well with vegetables and pairs well with cheeses. No surprise, it pairs well with vegetable AND cheese dishes. These Asparagus and Goat Cheese Mini Quiches from Southern Living are wonderful for brunch (who says bloody marys and mimosas are the only brunch beverages?) and store well. Sauvignon Blanc is one of the most versatile white wines available. Perfect for the warmer weather, the variety of Sauvignon Blancs on the market-- Old World and New World-- mean you have plenty of options. Like we've written about before, rosé has become a staple in wine racks and on wine lists across the world. One of the reasons it is so popular is its versatility. Rosé finds itself somewhere in the middle between red wine and white wine. "To achieve rosé nirvana, follow my 'Rosé Rule of P': serve it with anyting pink–lobster, shrimp, ham, pork–or anything Provençal–such as bouillabaisse, salade Nicoise, or grilled sardines"
We've rounded up a few recipes for you- both pink and Provençal- and a few of our favorite rosés- also pink and (mostly) Provençal. Fresh red berry and orange pith aromas of the La Vieille Ferme Rosé pair nicely with the chicken and pucker salad dressing-- plus what's could be more summer than watermelon and rosé? This August Kesseler Rosé made from Pinot Noir works well with the juicy tomatoes and late-summer vegetables of the gratin. Another classic spring and summer combination- strawberries and rosé. This light, refreshing salad works is the perfect lunch with a glass of well-balanced, elegant Miraval. A twist on the classic French Niçoise salad, this salmon Niçoise pasta salad would be perfect for a picnic with a bottle of Tablas Creek Patelin de Tablas Rosé. Finally, who doesn't love a little bubbly? Try these chocolate raspberry brownies with this Crémant de Bourgogne Brut Rosé from Domaine Michel Briday. Since Monday was Malbec World Day, keep the celebration going and try one of these tasty recipes with your favorite Malbec. One simple technique for pairing food and wine is to practice regional pairing. Having Italian food? Try an Italian wine. This certainly isn’t the only way to pair food and it’s not foolproof, but it’s a good template. Since Malbec has really flourished in Argentina and become the signature varietal for the country, what better recipe to start with than steak—an Argentinian staple. At peak beef consumption in 1956, Argentinians consumed 222 pounds of beef for every man, woman, and child. Now Argentina hovers around roughly 120 pounds of beef per capita (compare that to US consumption rate of 79.3 lbs per capita and the fact only ten countries in the entire world consume 50+ lbs per capita). Continuing in our homage to beef-fanatic Argentina, GRIDDLED GAUCHO STEAK WITH BREAD-AND-BASIL SALAD is another excellent pairing with Malbec. Moving away a little bit from the idea of regional pairing (but sticking with the carnivore theme), try a quintessential American cheeseburger. The lush Malbec will really bring out the flavors of this FAKE SHACK BURGER. Finally, one more veggie recipe for those not so Argentinian in their meat consumption habits. This AUBERGINE STEW from Jamie Oliver is a great meat alternative. Every season is rosé season, but as the weather warms (well...we hope it's warming up wherever you are!) and flowers bloom we find ourselves craving the pink libation a little more than usual. We've collected some of our favorite rosé recipes for you to try. If you want more inspiration, head over to our Pinterest page! Today is National Mulled Wine Day! Mulled wine has a history dating all the way back to the 2nd century. As the Romans conquered Europe they brought their winemaking with them. This unique wine drink is traditionally made with red wine and spices and served hot. In Chile, mulled wine is called candola or vino navega’o. In France it’s commonly referred to as vin chaud and in Italy, vin brulé. In Portugal the libation is known as vinho quente, though in the Porto region porto quente is more popular. One of the first known recipes for mulled wine is found in a medieval English cookbook from 1390. We’ve collected some slightly more modern recipes so you can celebrate National Mulled Wine Day. Some of our favorite recipes and wines to use are below. The 89th annual Academy Awards were last night, so wine not watch a movie? We’ve compiled a list of five of our favorite wine-related documentaries available on Netflix. Rudy Kurniawan earned the reputation of a wine savant and surrounded himself with some of high society’s most fervent wine connoisseurs. When Bill Koch, a top US collector, and Laurent Ponsot, a Burgundian wine producer, discover suspicious bottles a humorous and suspenseful investigation begins into one of the most ingenious cons of our time. The film follows seven winemaking families in the Burgundy region of France through the course of a full year, and delves into the cultural and creative process of making wine. This film shows a rare glimpse behind the scenes into the real Champagne through six houses—from small independent makers to illustrious houses. Prohibition: How did a nation founded on rights ever go so wrong? This three-part documentary film series tells the story of the rise, rule, and fall of the Eighteenth Amendment to the U.S. Constitution and the entire era it encompassed. The public stocked up before the law went into effect--141 million bottles of wine were sold in the 3 month period leading to prohibition. You can't watch a movie without popcorn and what pairs better with popcorn than wine? We've come up with two perfect options for you: Champagne Delamotte Brut and Cono Sur Organic Chardonnay. In light of last weeks post on Port wines (and decadent dessert pairings), this week we wanted to follow up with some dessert wine basics. There are few pleasures in the wine world as hedonistic as a glass of great dessert wine. Whether it be a honeyed, complex Sauternes or a delicate, frizzante Moscato d’Asti, these wines provide pure guilty pleasure and when considering the work that goes into crafting them, they are some of the most intriguing wines in the world. Simply put, dessert wines are wines where there is a degree of residual sugar that remains after fermentation. Generally wines in this category have 40 g/L or more of residual sugar and can soar to above 500 g/L in the most concentrated and rich examples. In order to halt fermentation and concentrate sugars and flavors either nature or man must introduce some variable into the winemaking process. If you mention dessert wine to the average wine drinker the first word that will generally come up is Sauternes. This golden elixir hails from the Sauternes region of Bordeaux and is the result of Sauvignon Blanc and Sémillon grapes affected by the fungus Botrytis cinerea. Normally this would lead to gray rot, which is a major threat to grapes. However, if the exact right climactic conditions exist Botrytis (or noble rot or pourriture noble in French) has the magical effect of shriveling the grapes and concentrating the sugars to above 100 g/L. The resulting wines are honeyed and incredibly rich and complex. Notes of orange marmalade, pineapple, butterscotch, wildflower honey, and white chocolate ooze out of the glass and the best examples are a mélange of exotic, luscious flavors. These wines are some of the most expensive to produce in the world and in many vintages none are made, so expect to pay a premium for the experience of tasting one. Sauternes from the famous Château d’Yquem regularly fetch some of the highest prices in wine auctions around the world. Recently a half bottle of this wine from the 1811 vintage was sold for over $84,000.00! Sauternes does not have a monopoly on noble rot though. There are also more reasonable examples in the style of Sauternes produced in the nearby regions of Barsac, Loupiac, Cerons, and Monbazzilac - if you’re lucky enough to find them, since they are rarely exported. There are also very similar examples produced in the United States, Australia, and other new world countries on exceptional sites in exceptional vintages. For other examples in France utilizing different grapes, look to the Loire Valley and Alsace and look for the term Sélection de Grains Noble. In the Loire Valley regions of Bonnezeaux, Quarts de Chaume, and Coteaux du Layon the grape of choice is Chenin Blanc. Noble rot turns this noble variety into a stunning nectar that is at once both viscous and light on its feet. Beautiful flavors of apple, stone fruit, and nuts marry with an intense florality to produce an incredibly rare and long-lived wine. In Alsace the Sélection de Grains Noble wines lean towards heady and exotic aromas and tropical flavors due to the aromatic varieties grown there: Gewurztraminer, Pinot Gris, and Riesling. Expect to smell and taste exotic spices such as ginger, cardamom, nutmeg, white pepper, and allspice paired with flavors of mango, guava, lychee, pineapple, apricot, and quince. Once again expect to pay a premium for the rarity and exceptional experience of these wines. Moving on to Germany, Austria, and Hungary and the wines that many would argue compete with Sauternes for the title of best dessert wine: Trockenbeerenauslesen and Tokajis. The Trockenbeerenauslesen wines of Germany and Austria are once again are the result of noble rot (Edelfäule) and are stunningly sweet and rich…much sweeter than Sauternes even. The purity and multi-faceted nature of these wines perfectly mirror the fact that they are most commonly made from Riesling. Another method of production for dessert wine involves stopping fermentation by the addition of strong neutral spirits. This process allows for a high alcohol level unlike many other sweet wines and thus is referred to as “fortifying” the wine. Port, Madeira, and Marsala are probably the most famous wines in this category, and due to the complexities and culture of these wines, I’ll save them for their own discussions. There are several wines produced in the south of France that fall into this category as well. These vins doux naturels are generally lightly fortified and the most famous examples include Muscat de Beaumes-de-Venise, Banyuls, Rasteau, Maury, and Rivesaltes. Grenache and Muscat are the key players with regards to grape varieties in these categories. The Grenache wines are quite varied and can be made in an oxidized style (rancio) and any range of colors from amber to ruby to almost black. The Muscats retain the aromatic character of the grape and are quite intense in flavor and aroma. Icewine (Eiswein in German) is one of the rarest dessert wines. Grapes must be exposed to a hard freeze in order to freeze the water in the grapes. This process greatly concentrates the juice and reduces the amount of juice in each grape to mere drops. This stingy return paired with the fact that the grapes must be precariously left on the vines until sometimes after the new year often results in outrageous prices, but with sugar levels usually over 200 g/L one doesn’t need much of this treasure! Germany is the spiritual home of icewine but Canada and increasingly New York also claim some exemplary examples. And while Riesling is the still the king of icewine, other traditional grapes such as Cabernet Franc and Chardonnay and hybrid grapes such as Vidal and Sevyal Blanc make convincing examples as well. Icewines can be surprising refreshing due to the exceptionally high level of acid that deftly balances the high sugar levels. Finally, dessert wines can be produced by the process of drying and rasinating grapes either on the vine or after harvest. Perhaps the most famous example of this style is the straw wine (passito in Italian) Vin Santo from Tuscany. Trebbiano and Malvasia grapes are laid out on straw mats or hung in the rafters of the attics of wineries in Tuscany to produce a wine that is redolent of hazelnuts, toffee, nuts, and dried apricots. A similar method is employed in the Veneto to produce Recioto della Valpolicella, a velvety red dessert wine. In Alsace the best plots are allowed to hang on the vine as long as nature allows to produce the exceptional vendanges tardives (late harvest) wines. These wines are concentrated and rich but are not cloyingly sweet. In the Loire Valley, this method is practiced as well with Chenin Blanc. One sees this method also used in the new world. Vin de Constance from South Africa is a notable historical example that has recently been revived. The general rule to follow when pairing sweet wines with desserts is that the wine must be sweeter than the accompanying dessert. The red dessert wines are great partners for berry desserts or chocolate desserts (they pair similarly to ruby or vintage ports). Riesling, Chenin Blanc, and Alsace varieties often pair well with apple and stone fruit desserts, while the more aromatic varieties (Gewurztraminer and Pinot Gris) are beautiful partners to tropical fruit or exotically spiced desserts. For caramel, butterscotch, or nut-based desserts turn to Vin Santo or an amber Rivesaltes. Sauternes can often be challenging to pair with desserts but is a classic partner for foie gras. Indeed many of these wines make beautiful pairings for rich savory foods with sweet elements or for ethnic cuisines such as Chinese, Japanese, Korean, Indian, or Middle Eastern. Don’t miss trying a classic duck l’orange with a smoky, sweet Pinot Gris vendanges tardives from Alsace! However, these gorgeous wines can stand on their own and be enjoyed as dessert in a glass. Port is wine that has been fortified with aguardente (sometimes referred to simply as “brandy”) during fermentation. The addition of high-alcohol brandy stops the fermentation process in its tracks, leaving a sweet wine that packs some power. A tawny-colored Port with more caramel and nut flavors (and more sweetness). Port must come from a specific region in Portugal, from grapes grown in steep, terraced vineyards along the Douro River. However, the word “port” is not a condensed version of “Portugal” but a reference to the port town Oporto, from where the wines are exported. Tawny is aged in wooden casks and released ready to drink. The best tawny ports are labeled with some indication of their age – 10, 20, 30 years old and so on. This is an average age because they are blends of different vintages. Serve tawny port with chocolate, caramel, dried fruit, nuts (like walnuts and almonds), and aged Cheddar cheese. Pair with spiced cookies, gingerbread, almond cakes, or orange-scented desserts. Delicious paired with a creamy dessert such as cheesecake or creme brûlée. Typically the least expensive type of port. Ruby ports are blends of wine from different vintages. Rubies are usually sold after spending two or three years in large wooden casks. They are not intended to be cellared. Rubies have warm, berry flavors and deep ruby color. Warre's Ruby Port: Enjoy with red cherries, chocolate desserts and fresh berry desserts. In years when the quality of grapes and the conditions in the vineyards are exceptional, grapes are set aside to make single-vintage port. Vintage port is a relative rarity, since few years are exceptional enough to be declared vintage worthy. Vintage port is labeled with a particular year, unlike most ports which are blends of various vintages. Vintage ports are big wines, with black-fruit flavors and powerful tannins when young. Pair with something equally intense, like a rich, dark-chocolate dessert. Sources: Here, here, & here.